I’m not entirely sure how I came across this video – it seems like the kind of thing that a group of high-end LSE students would make in their spare time, to express their Hayekian frustration in a Keynesian world. briefly explain some of their differences. 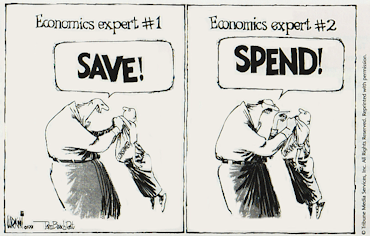 The question that plagues economics: how does it all work? It’s relatively easy to see how microeconomics works, because that’s just a conversation about what you do, and what I do, and why. But the economy, as a rule, is the sum of our collective actions. We’re all robots and do exactly the same thing (ie. my behaviour is perfectly influenced by your behaviour, and yours is perfectly influenced by mine, and because you do what I do because I’m doing it, and I do what you do because you’re doing it – there is perfect harmony, without beginning and without end). We’re all completely independent of each other (ie. chaos). People do things sometimes because they’re influenced by the people around them, and sometimes they do it independently, and often, they have no idea which is which. I guess it comes as no surprise that option C is the reality. And that’s a bit of a pain really: because any society usually has a government, and the government needs to know what’s going on before they can decide if they need to do anything. Especially in the 1930s, when everyone was depressed and things seems to be going horribly wrong. People do things because they are guided by their animal spirits. It’s all a psychological game, really. What we need to do is lift their spirits. So the government should spend money on something, anything, to get people working when they’re experiencing a recession. This will lift their spirits. And they can stop saving and spend their money instead. At which point, boom – good times will be had by all. And then governments can tax people in the boom to pay back the money that they spent in the bust (spent on hiring people to dig ditches, etc). Yes, that doesn’t sound very sustainable in the long term, perhaps. But in the long term, we’re all dead. It sounds like the kind of heartless pragmatism that excites me greatly. Keynes, don’t be such a damned fool. The bust is not the problem: the bust is a direct result of that boom period. The boom is the problem. When people are spending money furiously in the boom times, the rapid flow of money makes it cheap (ie. interest rates get nice and low). When interest rates are low, people borrow money and spend it on stuff. Eventually, they start spending it on pointless sh*t, causing housing bubbles and the like. I’ve invented a new word for it: “malinvestment”. And as soon as someone pulls a plug (like your Federal Reserve raising interest rates, or some such nonsense), then it all comes crashing to a halt. Which is another way of saying “things adjust back to their appropriate levels”. And there you are saying that in the aftermath, we should just sow the seeds of a new boom? And because Keynes was advocating spending, he got super popular. And Hayek got relegated to “I’m sorry – who are you again?” status. When the world suddenly went “Oh”.